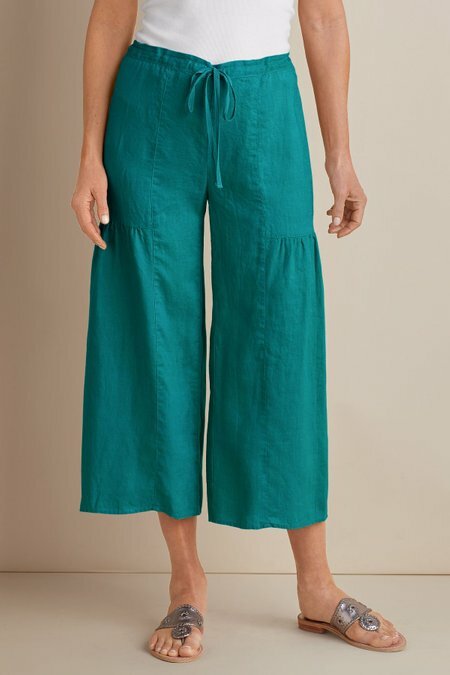 A forever-wear pair of garment-washed cropped pants crafted of plain weave gossamer linen for a relaxed, breathable fit and feel. Wide leg with gathered detail at thigh. Rigid/elastic waist with twill tape drawstring. Crimson, deep lagoon, khaki. Linen. Misses 23-1/2" long. Sits just below natural waist.